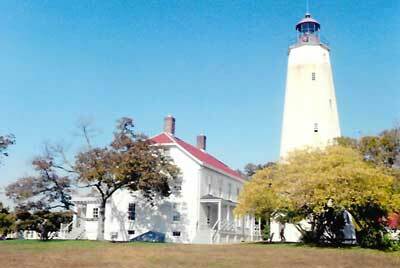 The New Jersey Lighthouse Challenge has been held annually in October since 2000. 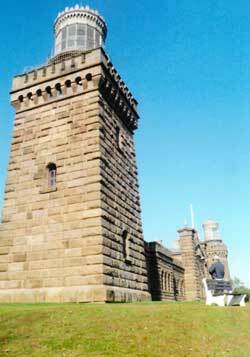 All ten New Jersey lighthouses accessible by land are opened to the public for climbing, as is the Tucker's Island replica. In recent years, several museums and former life saving stations have been added to the two-day event. I participated twice, in 2006 and 2012, and had the good fortune to experience near-perfect weather. The following pictures are from both trips. 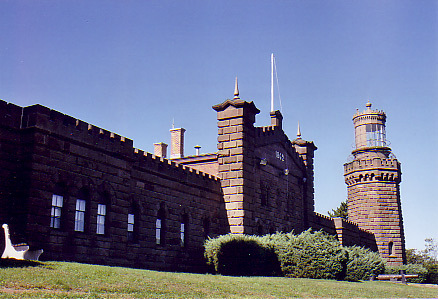 The fortress-like structure of Twin Lights is unique among New Jersey lighthouses. Built in 1862, it is the most recent of a succession of twin beacons on this site dating back to the early 19th century. 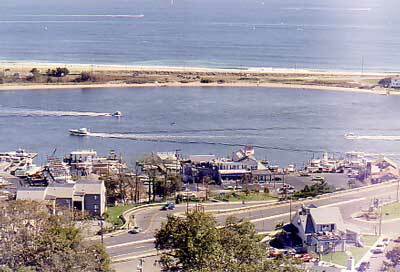 It is situated above the borough of Highlands on one of the highest points on the Atlantic Seaboard, the Highlands of Navesink, which form a peninsula between Sandy Hook Bay and the Navesink River. In 1899, Guglielmo Marconi set up a radio transmitting station here, intending to demonstrate his wireless by transmitting the results of the America's Cup. He was able to broadcast much bigger news when word was received that the fleet led by Adm. George Dewey was approaching New York Harbor following its devastation of the Spanish fleet at Manila Bay. 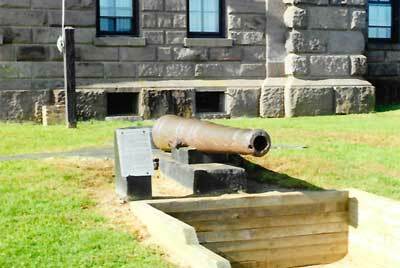 The field piece on the left is known as the "mystery cannon." Excavated on the grounds, its source remains a mystery to historians and archaeologists. 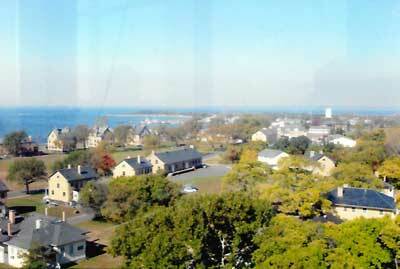 In the center photo, the towers of the Verrazano-Narrows Bridge may be seen dimly on the horizon, looking across Sandy Hook Bay and Sandy Hook to New York Harbor. 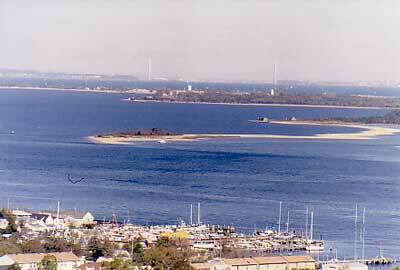 The white tower at right center on Sandy Hook is Sandy Hook Lighthouse. The third photo shows marine traffic leaving and entering the Shrewsbury River, which empties into Sandy Hook Bay. The oldest lighthouse still standing in the United States, the Sandy Hook Light was constructed in 1764 and financed through a lottery. After the American Revolution, President George Washington commissioned the structure. When built, the lighthouse was at the tip of the peninsula, but over 250 years of tidal action have extended Sandy Hook by 1 1/2 miles. 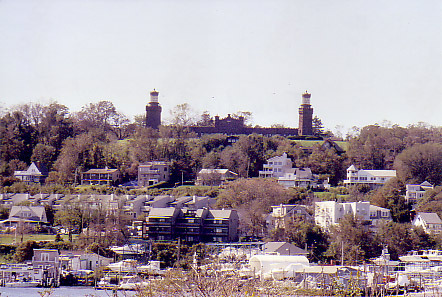 The lighthouse shares the peninsula with Fort Hancock, established shortly before the Civil War as part of the New York Harbor defenses and decommissioned in the 1970s. Some bunkers and gun emplacements can still be seen, as can remnants of the base's Nike missile station, one of dozens that ringed U.S. cities during the Cold War. The second photo shows some of the fort's buildings. The row of larger buildings along the water are the officers' quarters. Normally, these buildings were constructed to face the Parade Ground, but at Fort Hancock they face the water so that the sunsets could be viewed. 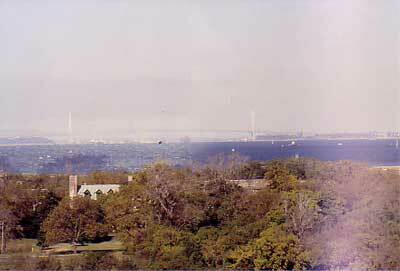 The third photo looks across New York Harbor to the Verrazano-Narrows Bridge. 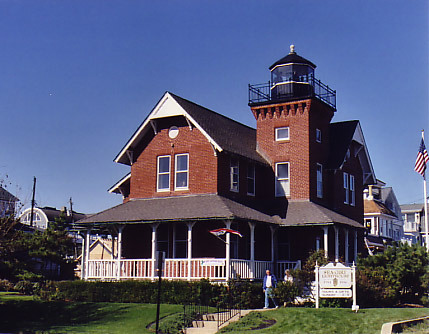 The first Victorian structure on the Challenge tour, the Sea Girt lighthouse was constructed when the need was perceived for a lighthouse between Twin Lights to the north and Barnegat to the south in an area that has over the years been a notorious ship graveyard.